Upcoming Event: Bald Eagle Watch! 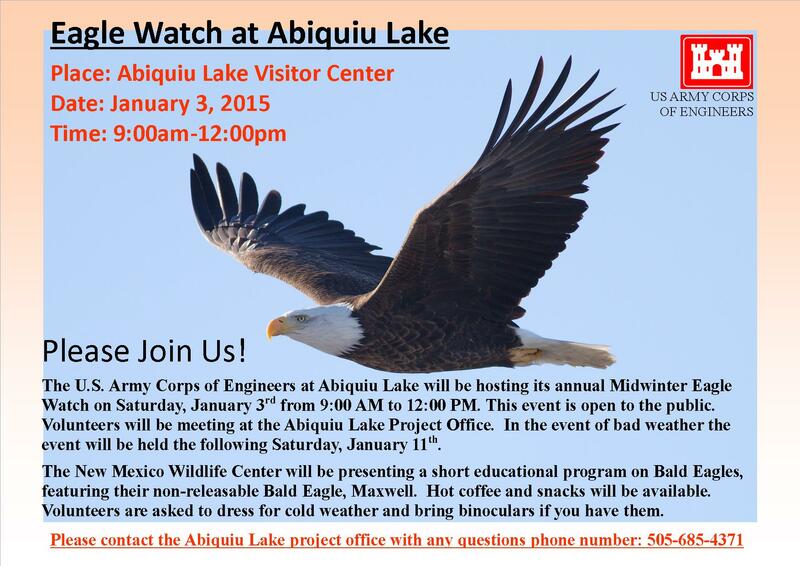 Please join New Mexico Wildlife Center and the U.S. Army Corps of Engineers for our annual bald eagle count at Abiquiu Lake on January 3, 2015. National Wildlife Federation officials have asked that participants in each state count eagles along standard routes to provide data trends. The basic objectives of the survey are to index the total wintering Bald Eagle population in the lower 48 states, to determine eagle distribution during a standardized survey period, and to identify previously unrecognized areas of important winter habitat. The annual midwinter survey represents a unique source of long-term, baseline data. Unlike nesting surveys, it provides information on both breeding and non-breeding segments of the population at a potentially limiting time of year. The count has become a national tradition since 1984, and is an annual event at Abiquiu Lake. In addition to providing information on eagle trends, distribution, and habitat, the count has helped to create public interest in the conservation of our national symbol, the Bald Eagle. Volunteers are asked to dress warmly and bring binoculars, notepads, and drinking water. Hot coffee and snacks will be available. Bald eagles are a common and welcome sight at Abiquiu Lake during the winter. 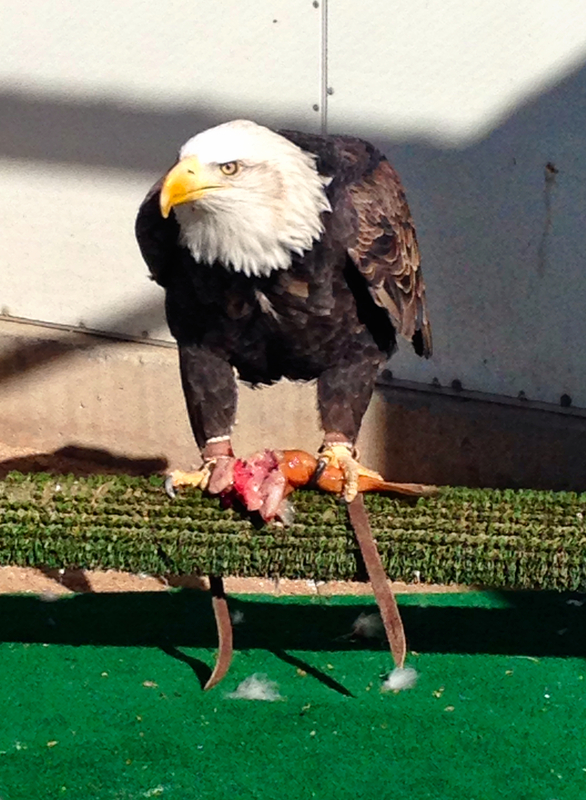 Unfortunately last year, NMWC cared for two bald eagles, both of which died from lead poisoning. In 2009 27 of 40 bald eagles treated in Iowa rehabilitation centers had toxic levels of lead in their blood. Where does this lead come from? Lead in ammunition and fishing gear. While federal law banned lead shot for hunting waterfowl in 1991, lead in ammunition for hunting upland birds, mammal species like deer, elk, wild pig, sheep, and coyotes distribute millions of pounds of lead into the environment every year. Additionally, the U.S. Fish and Wildlife Service estimates that 4,382 tons of lead fishing sinkers are sold every year in the U.S. When lead bullets enter an animal’s body they fragment. These fragments are scattered along the wound channel and often are found in abundance in its organs. A deer shot with lead bullets and not recovered is a poisoning machine. Gut piles left by hunters are probably a more pervasive source of lead poisoning. In a study conducted in the state of Washington, 90% of offal piles showed lead fragments and 94% of deer carcasses contained fragments. It takes very little lead to kill a bald eagle. There are alternatives to lead ammunition and lead weights for fishing. Join us at the Bald Eagle Watch and learn about these birds and why they are worth protecting! CoCoRaHS Night: Now We’re Ready for Rain! Last night’s CoCoRaHS event was a great success, with 28 new rain gauges going to happy homes in northern New Mexico! We had quite a few Master Gardeners from Santa Fe present, with people from Rio Arriba, Taos, Santa Fe, and Los Alamos counties. Hopefully these new citizen scientists will get their gauges up before our next precipitation event! 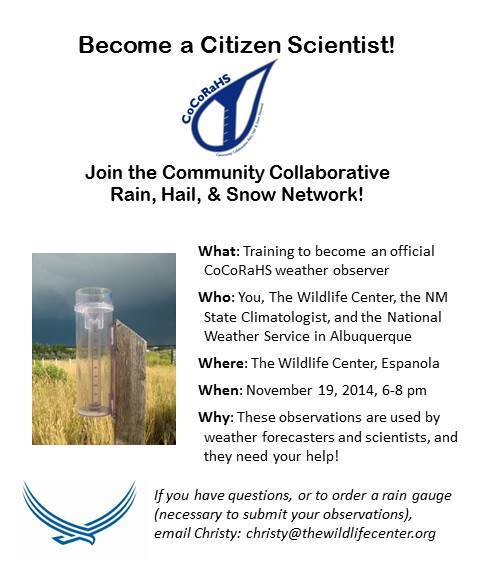 If you missed last night but still want to participate in the CoCoRaHS network, it’s not too late! The network has online training videos located here, and our friends at Weather Your Way can sell you an official rain gauge here. Kerry Jones from NWS ABQ shows off the CoCoRaHS cell phone app. 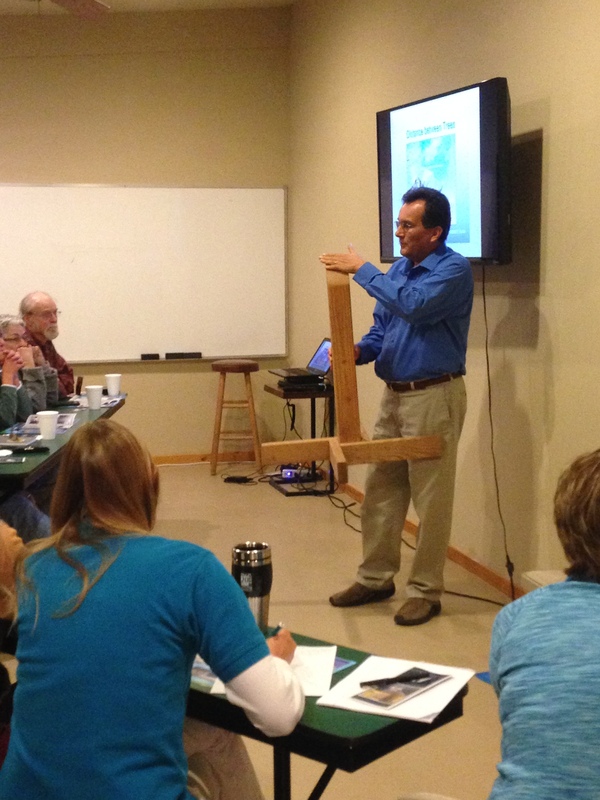 Dr. David DuBois demonstrates how to use a snow swatter to measure snow. Dr. DuBois makes sure everybody knows how to mount their rain gauge. Many thanks to the National Weather Service in Albuquerque, as well as Dr. David DuBois, for their expertise, and thank you to all of our fantastic citizen scientists for participating in the event! 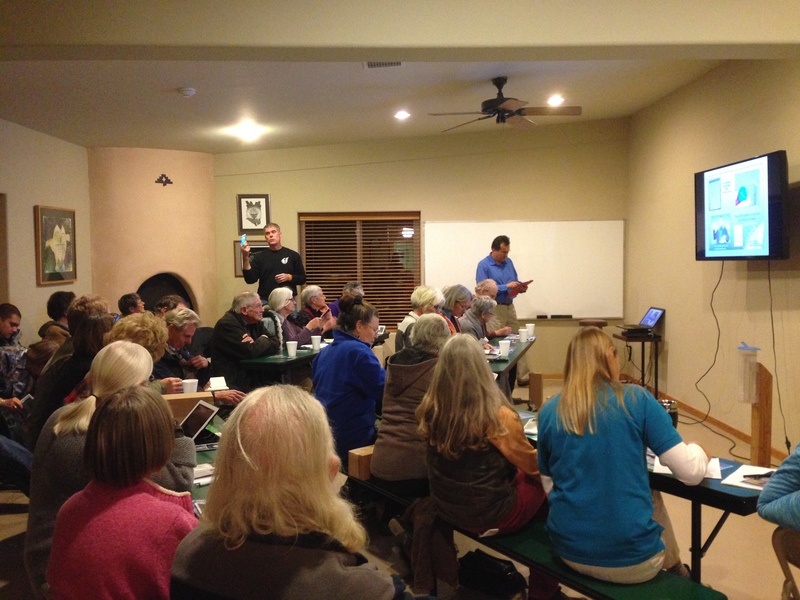 Stay tuned for upcoming science events and activities at New Mexico Wildlife Center- we have many more planned! 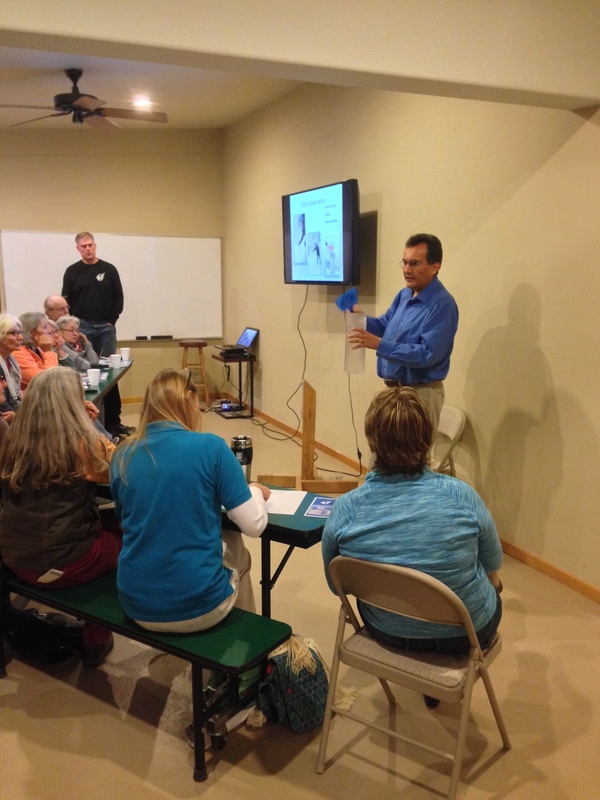 Join us at The Wildlife Center on November 19 for an official CoCoRaHS training! CoCoRaHS stands for Community Collaborative Rain, Hail, & Snow Network, and this network of volunteer precipitation observers are very important to weather forecasters, drought monitors, and researchers. Precipitation is a tricky thing to measure. Rain gauges are the best, despite problems such as rain splashing out of the gauge, but we can’t cover the globe with rain gauges, and it’s very difficult to put rain gauges in the ocean! Radar can be used to estimate rainfall, but that method also has problems, especially in northern New Mexico where the radar beam’s lowest scan level can be above 7000 ft, or east of the Sandia where the mountains block the beam. The Tropical Rainfall Measuring Mission satellite was the first precipitation radar in space, and for the last 17 years it has been measuring rainfall. Unfortunately, this satellite covers a large area and can’t see all of the rain that falls. We can use other satellites to try to fill in the gaps, with marginal to great success, depending on the situation. In my graduate school research, I discovered that our satellite estimates can be quite different from what radar and rain gauges show in the southwest U.S. I really needed more rain gauges! Special rain gauges are necessary to be an official CoCoRaHS observer. This is because the data needs to be comparable. TWC will be ordering rain gauges for those interested in participating, and we’re getting a bulk discount so they will cost around $26. Please join TWC, our New Mexico State Climatologist, and the National Weather Service in Albuquerque for this very special citizen science night!